Corporate bankruptcy is becoming an increasingly important topic in todayâs turbulent environment. The bankruptcy decision can be a matter of life and death for the organization dealing with distress, but the impact of the phenomenon is magnified by the variety of business relationships in which companies typically are involved. If you are considering or need to know more about bankruptcy, this book will help you through all the important steps. Since bankruptcy affects customers, supply chain or network partners, managerial and non-managerial employees, landlords, and others, understanding the bankruptcy process can facilitate best-practice development and the protection of the organizationâs interests both before and after a bankruptcy petition. This book does not attempt to provide advice; each case is unique and should be addressed by competent legal counsel. Rather, youâll be provided with an overview of the fundamental principles and processes of both Chapter 11 reorganizations and Chapter 7 liquidations, incorporating examples drawn from relevant legal decisions, research findings, and common experience to highlight the issues involved and provide a basis for discussion. 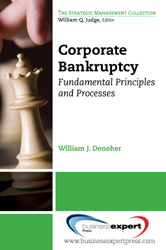 The author also includes details on a number of special topic areas, including small business bankruptcies, governance issues, contractual agreements and obligations such as franchising and collective bargaining agreements, and newly emerging issues surrounding the use of derivatives.